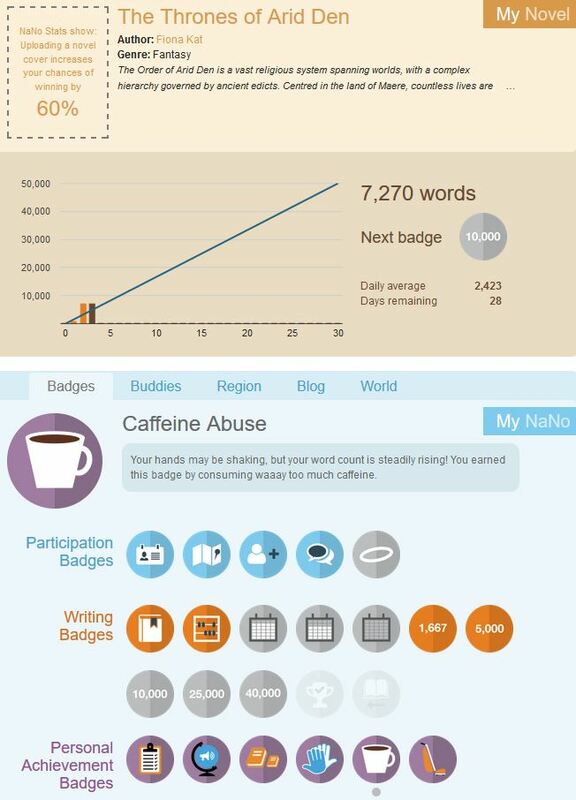 Nanowrimo – Screenshot – I like the new range of badges. The caffeine abuse and procrastination badges are particularly apt for me. The kids are home from school today for the Melbourne Cup public holiday and it’s virtually impossible to write when there’s the standard adolescent war over homework versus video games. Being a strict and therefore mean parent, my rule – that a homework assignment due in less than 24 hours takes precedence over Minecraft – seems to have generated more than its fair share of tension in the household. As a result, my creative energy is in hiding. I’m using the time to catch up on the third module in the Open2Study Astronomy course, which is absolutely fascinating. I often lament that my mathematics skills weren’t good enough for me to follow the physics and astronomy route in my studies. The good news is that I’m already well above par in the Nanowrimo word count stakes and even if I didn’t write a single word for a couple of days I would not fall behind. However, that said, I’m enjoying my story thus far and want to know what happens next. Current word count: 7270/50,000 words. Today’s writing soundtrack: a horrendous series of bluegrass-style banjo covers of pop songs that my husband found on Spotify. For the first time in my Nanowrimo history I have started out with a well-above expected word count and I can’t really account for it, except for the fact that I am enjoying writing my story. Oh, I know that the writing is not my best quality. I wish it had something more timelessly poetic about it. At this stage it’s still a bit on the thin side. It’s more plot and dialogue than well-developed scenery. I am conscious that while my mind vividly imagines the landscapes and buildings and spaces in my story, my writing does not yet adequately convey this information. However, I take it as a positive thing because the story itself wants to be told. Developing and enriching the language in it is a second-draft task. In 2014 I was a “Pantser,” in Nanowrimo terms: I largely made it up as a stream of consciousness story. I had a couple of vague ideas but when I started I really made it up as I went along. It was not a great story. It was hard to want to write it. I didn’t like it. In some ways it felt l had used up all of my good writing ideas in Nano 2013. But my Nano 2015 story is one that I’ve wanted to write for several years; I just never felt that I had the ability to do it justice. Sometimes I wonder if it might be better as a short story than a short novel, but as I write it in all its superfluous detail, I find myself honing in on the parts that actually matter. The story I’m writing was, like so many of my writing ideas, originally derived from some of my vivid dreams / nightmares. Some specific scenery came from those dreams and eventually, as I linked them in my mind, I found a fantasy story hiding in there. In my story the main character, a woman named Zaira, is a low-level hermit within a religious system. The Order holds incredible political and cultural influence and while in its earliest times it existed to support humans with supernatural abilities, over the millennia it has become so deeply entrenched in political systems that it forgets where it began. In that system, where once every three centuries they are required to select a worthy King and Queen to rule the people as a kind of social reset button, Zaira is called up to fulfil the role of Queen. The story begins with her receiving this mandate from her superiors, and it follows her journey as she unwillingly acquiesces to the leaders and finds within it a chance to fulfil her own personal ambitions. There is a lot more to it than that but at this stage I’m not sure if I will write enough during Nanowrimo to enter the “book 2” stage, as I’ve listed it on my Scrivener layouts. Posted in nanowrimo, science, writing and tagged astronomy, creative writing, journal, Korpiklaani, musings, nanowrimo, nanowrimo 2015, parenting, writing on November 4, 2015 by Fiona.